The state-owned Air India will begin new flight services to Prayagraj (Allahabad) from Delhi, Ahmedabad and Kolkata. The Kumbh Mela at Prayagraj has been granted the status of world heritage by the UNESCO. As part of the rituals, devotees take a holy dip in Ganga, Yamuna and Saraswati rivers at Sangam. As per the Hindu scriptures, the bathing ritual will absolve the devotees of their sins and will help them attain liberation. Some of the other rituals performed in the 55-day event include Makar Sankranti, Paush Purnima, Mauni Amavasya, Basant Panchami, Maghi Purnima and Mahashivratri. 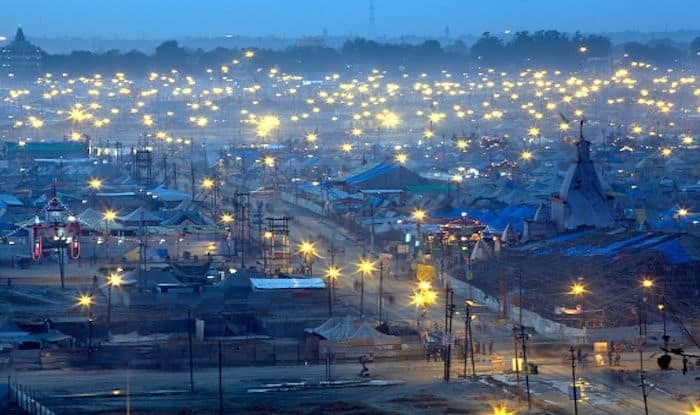 In view of the celebrations tomorrow, an eye camp called ‘Netra Kumbh’ with check-up facility as well as a spectacles distribution centre has been organised in Prayagraj, stated news agency ANI. Moreover, virtual reality kiosks have been installed in the city which displays videos of the ‘mela’, ‘aarti’, ‘shahi snan’ and others in 3D format. The videos can be watched using specially designed headsets through an app called VR DEVOTEE. For 2019 Kumbh, the UP government led by Yogi Adityanath has allocated funds amounting to Rs 2,800 crore. The Mela which will take place in over an area of 3,200 hectares has 1.22 lakh toilets, 20 thousand dustbins, and 42 drains. A food hub has been set up at Kumbh Mela area to provide special cuisines of the various states of India. The city has also been beautified by the ‘Paint my city’ initiative of Kumbh Mela Authority. The intersections, flyovers, buildings and walls of Prayagraj has been painted. Over 1000 artists, of five agencies empanelled by the Authority, are engaged in decorating the city with murals. Meanwhile, the authorities hosted a laser show depicting the history of the grand festival. During the centuries-old festival, Prayagraj will host over 5,000 camps from multiple akhadas and ashrams. According to officials, representatives from 192 countries are expected to visit the festival in the month of February. On the occasion of the Kumbh Mela, new flight services are set to commence its operations. The state-owned Air India will begin new flight services to Prayagraj (Allahabad) from Delhi, Ahmedabad and Kolkata. The flight operations will begin from January 13 to March 30, 2019, stated the airline. Low-cost carrier SpiceJet has announced special daily flights between Prayagraj and Delhi from January 6, 2019, to March 30, 2019. The flights can be booked at a price of Rs 3762, stated the airline in a press release.